My kitchen is almost free of plastic packaging. That’s right. I predict in the next fortnight there will be no more food in plastic packaging. The pantry and fridge will be void of packaged pasta, rice, noodles and frozen vegetables. Admittedly I did decant my spices into glass jars I found at a second hand store and recycled the plastic (more on that below). The last remaining plastic packaged items are rice paper rolls. Hurrah. I’m not going to throw out food for the sake of my plastic-free crusade. I have accepted this is a slow process and I'm tackling this at the speed of a turtle. Turtle speed power! After all it's not about perfection, it's about making better choices. Being new to this eco living and less plastic thing I feel the need to always remember that I'm still learning. While I have been tempted to throw all the plastic packaging away and start fresh, instead I'm honouring the resources by reusing instead. Some of the plastic packaging will work great to put loose vegetables and food from the bulk store when we do our weekly shop and I'll use them until they begin to wear. Then I'll look into getting reusable cloth bags. I wouldn't be surprised if this doesn't happen for another year. We buy our grains, beans, rice, flour, nuts, cereals from a bulk store now and the vegetables are from a grocer as they have more plastic free produce. Shopping at bulk food stores has been an interesting adjustment. Nothing is packaged! Instead there are big bags, dispensing bins, tubs of whatever food you want. I then come along with my own packaging, bag, container, jar and fill it up. Just yesterday I took bags to the bulk store, they weighed them, then I filled them up with lentils and nuts (seperate bags of course), the staff at the store reweighed subtracting the original weight, I pay for the food not the packaging, we have a chat, then I leave. This is called to tare. There is a bulk food store right here in our suburb that the Builder's grandparents shopped at. It's not huge and is more of a ethnic food store, but is affordable compared to the dedicated bulk store Friends of the Earth in Collingwood. I would like to visit CERES bulk food store soon too. I need to visit these stores if I want more variety, spices, cleaning products and even shampoo! Yes, I can get my shampoo bottles refilled. Or go back to shampoo bars. When I get home I then transfer most of the food to glass jars that I've kept from recycling or gathered from Op shops. You don't need to buy new glass jars at all. Repeat, you don't need to buy new glass jars. The old pasta bottles are sturdy and work well. Let’s get back to these plastic packages I have been left that we can't use to shop with. Some went to landfill but most we discovered are a soft plastic that can be recycled through the new RedCycle program at Coles a local chain of supermarkets similar to Kroger in the US or Tesco in the UK. REDcycle allows shoppers to return packaging to be recycled into outdoor furniture and signs. Presently, soft plastics can't be recycled through kerbside collection. What can be recycled at REDCycle bins? 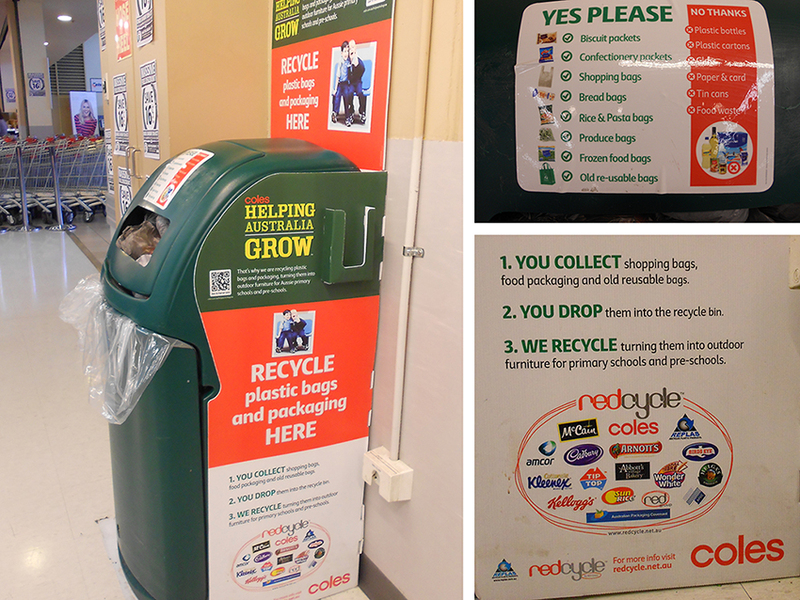 REDcycle bins are found at a variety of Coles around Australia. Hopefully there will be more in other locations soon. We are keeping a box in the pantry to collect any incidental soft plastics that may find themselves in our house. It's essentially there for emergencies including any soft plastic i pick up on my walks, and if the builder buys food that is carried in soft plastic or visitors at the house. While the Builder supports my decision to say no to plastic packaging, I realise this is my journey so I don’t beret him if said plastics end up on our pantry shelves. 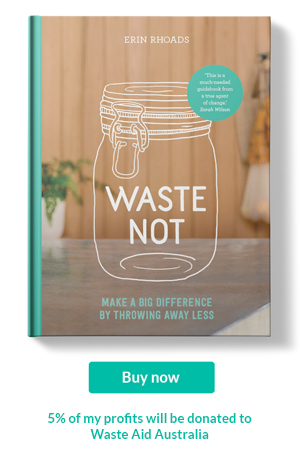 Habits are had to break and giving consumers the option to recycle is fantastic. But I feel we need to see more innovative ways to stop all this plastic packaging. We can't recycle our way out of this. I guess this is when we begin writing to companies and the government to look at alternatives. We ran out of our plastic cling wrap too and are using plates on top of bowels, jars, tupperware instead. And it works! I did read about beeswax wraps and had a look online to buy. They were a little expensive so I might try making my own with local beeswax and cotton remants from Spotlight. The beeswax acts as a water proof barrier for the cotton and they can be washed in cool soapy water (never hot). I've also begun making homemade dips like an avocado tahini dip which is amazing! Simple vinegar based salad dressings, mustards, mayonnaise and pasta sauce. Making my own apple and pear cider vinegar from scraps. It's very easy! I take 6 large apple cores and peels, 1 tablespoon of sugar and around 6-7 cups of water, preferably without the chlorine (I was told to let water sit for 24 hrs and the chlorine will break down?). Cover everything in a sterilised jar then cover with a breathable cloth. I try to do this on a Friday night so then I can stir it several time on the weekend. Then once it starts t bubble you can decrease stirring to once a day which you'll ave to do for two weeks. By this stage it will be ready so strain and bottle, remembering to burp (open to release the air) the bottle every so often. The leftover fruit goes onto the garden. Saving up the tops and tails of all my vegetables when cooking to make a vegetable broth and i've also experimented with making a relish with them too. Zucchini scrap relish is yummy! Storing my fruit and vegetables properly. Such as tomatoes in the fruit bowl not the fridge, carrots in water. Wrapping herbs in a damp towel. Avocado in a glass jar with the seed. Using citrus skins infused in vinegar to make homemade cleaning products. The oils in from the citrus really help to cut through grime. I just fill up a jar 3/4 of the way with the peels then top with the vinegar and let it sit for six weeks. Strain it off and into a glass pray bottle I upcycled from an old glass bottle I found at home. The citrus is then sprinkled on the garden. Making candied citrus peel. I'm not wholly sold on that but it's an OK snack. Now we are no longer using plastic, we are storing food differently too. Glass jars for the freezer. Which might sound intimidating but really it's not. To freeze cooked food, i simply let it cool down before transferring to a jar. I never fill to the top, leaving a two finger gap to allow the food to expand. I also try not to use glass jars with shoulders too and the wider the mouth, the better. Also be careful to stack the freezer so nothing slips out. I have been thinking about getting old socks to put around the jars just incase a jar should fall or if it breaks. If I want to freeze raw vegetables or fruit in their own and not part of a meal, i'll put them onto a tray and freeze, then place into a glass jar. That way I can get out what I need easier, for example if i need half a cup of frozen carrots then I can pull them out easily, just like a plastic bag of frozen vegetables. I was freezing food in the plastic bags but find the packaging gets holes rather quickly. So off to RedCycle it went. I'm also been thinking about how lucky I am to access to stores where I can buy food without packaging (technically there is packaging, but I don't have to deal with it), the time to research and try this new way of living out. Having an OK income is a factor that could make it easier but if anything I'm saving money. Then there is also my physical ability because buying in bulk is heavy on the arms! Part of this journey has highlighted that some of these eco swaps are easier for those with less physical ability, time, location and money. Just something I need to keep in mind. I have a holiday to Myanmar coming up. I am eagerly counting down, until I get to shut down my computer, ditch my phone and spend two weeks in a new land. I also plan to say no to plastic bottles. Myanmar (also known as Burma) lays snugly between Thailand, India, China, Laos and Bangladesh. Besides being worried about snakes (I hear they have many) I am also worried about, the waste I could potentially create while I am there from plastic water bottles. Why am I thinking of buying water bottles when I can use my trusty Sigg bottles? Myanmar does not have safe tap water and buying plastic bottles is the easiest way to avoid getting sick. Water is kind of a necessity so I’m in a little bit of a panic mode thinking of how I am going to combat this issue. Especially with the heat, I know my water intake will be higher than normal. A lot higher. I cringe thinking back to how many plastic bottles I went through in India or Cambodia. Often these countries do not have adequate tap water and your reliance on a disposable bottle of water becomes greater. Then you travel around these countries and see where these water bottles end up in make do landfill on the side of the road, discarded in local environments and clogging up waterways. And here I sit, sipping water from my glass realiSing with uneasy guilt just how much we take water for granted. Not just clean water, the ability to reuse the vessels it comes to us in. The internet coughed up results like tablets, purifiers, LifeStraws, and boiling water. Tablets were my first go to option. But then reading in more depth, the chemical factor got to me. The tablets varied between iodine and Micropur, each with drawbacks like the chemicals going into my body and high iodine levels. But the ease of popping tablets into water and waiting for them to work their magic does make them an easy and carefree option. Then I think of the packaging of the tablets. It all got a bit much and I put them into the ‘might be good in case of emergency’ list. Filters looked great. The total filter especially ticked yes boxes. The price and size of the ones that offered filtration of parasites made me take a step back. If I was going somewhere for a longer period of time I wold definitely go in this direction. Plus Cheryl Strayed made working filters sound like fun. Really, she did. Yep, they are made with plastic but can be reused many MANY times. It’s disposable plastic I am trying to avoid here after all. LifeStraw is a miraculous device that works as a straw but with a built in filter. Check it out, because it is awesome. The straw lasts for 3-5 years, depending on how much it is used. So the potential for it to be used over a long period of time is definitely a bonus. Plus the price is affordable. There are different styles but I am having a hard time reading their website, so will need a little more investigating. Boiling water seemed like the best option and most effective. Boiling water will kill all the harmful things that make people sick. Then all I need to do is transfer my boiled water to my Sigg water bottles. So simple and I know I can boil water. The only problem is finding a place to boil water. The logical step is to email places that I am staying to see if they have kitchens that I can use. The downside is if I want to make the time in my busy schedule to sit down and boil close to 2L of water each night. I know there will be instances when I will need to buy a plastic water bottle. There is nothing worse than being sick, even more so when you are in a foreign land and can’t speak the language. If I have to choose between myself and a plastic bottle, I will ultimately pick what is best for my health. Until I am faced with that decision I will do the best I can. I have seen what a country looks like with consumption of plastic being tossed aside and forgotten. I don’t want to leave my waste behind for them to deal with. I want to explore this country with purpose and tread lightly. 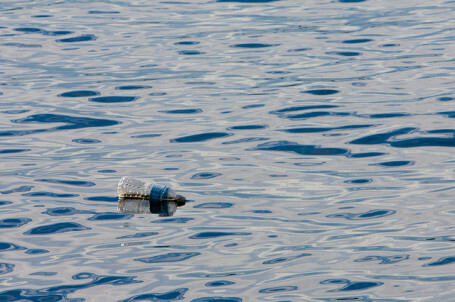 Have you used any of the above methods for dodging plastic consumption while travelling or use for other reasons? I would love to hear your thoughts in the comments below. If you want to help get clean water to Myanmar check this article here and here (I know the last link are a company that produces plastic products, but hey, they are trying to help).